THANK YOU ROSARITO! It was another great BLUES AGAINST HUNGER event at Cerveceria Surf & Sushi yesterday. We raised lots of food for Heart of Baja and had a great performance by this week's Special Guest Star Martin F Tramil. 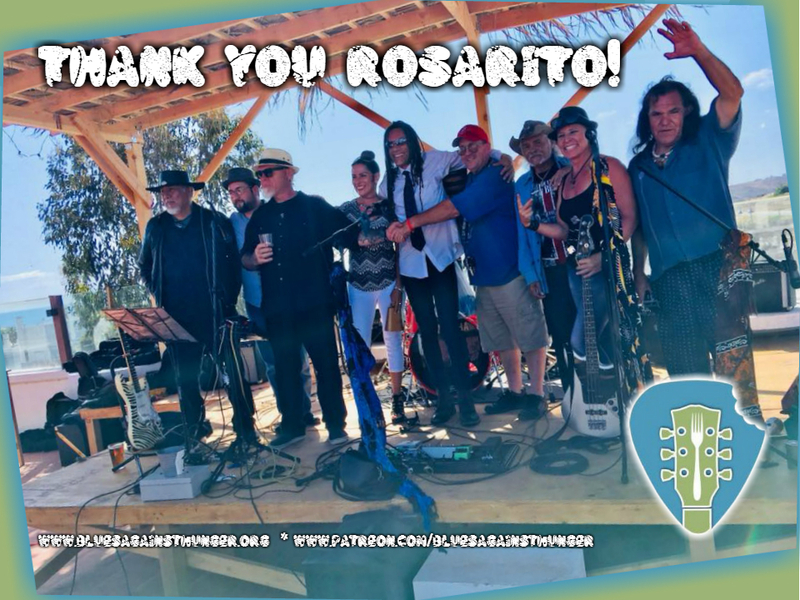 We want to think the awesome musicians that participated; Left to right - Arthur Cardenas on guitar, Oscar Quiñones Nogueira, myself, Teresa Mala, Martin F Tramil, Craig Klein, Fox, Sweet Rachel Pack and Tom Olmos. Thank you all we love you. We want to thank our volunteers and supporters; Bertha Machado, Connie Pirce Panthen, Craig Klein and Marilyn Widd and Les Widd of Heart of Baja and Angie Gomez (sorry you were sick). To all of our wonderful sponsors that make our weekly raffle possible, which without the event would not be possible - Pikin Adventure Park, Los Amigos Restaurant, Carolina's Beauty Services, La Guerita Restaurant, Pan Cake Republic, Baja Seasons Resort, and of course to everyone that attended, and especially this giving hearts that donated non-perishable food. Noel Huelsenbeck and the friendly staff of Cerveceria Surf Sushi Pub for being such generous and supportive host of this event. The beer is terrific, the sushi is mouthwatering, hospitality warm and welcoming. We hope to see all of you next week. Please tell your friends and come join us for another Sunday afternoon of music, friends, good times, good food and beer...all for a good cause. THIS WEEK JUNE 3 - Special Guest Saxophonist Phillip Singletary Plays the BLUES, along with a performance by singer Teresa Mala. RESERVE YOUR SEAT TODAY!